Dates and Programmes for the concerts in the 2017 - 2018 season are given below, which are now of historical interest. As you will see the last concert given at The Sands Centre was by the Hallé Orchestra in May 2018. Owing to the withdrawal of grant funding, and the possibility of major building work at the Sands Centre no concerts have been arranged for the foreseeable future. developing concert audiences for the future - schools programmes, and the like. 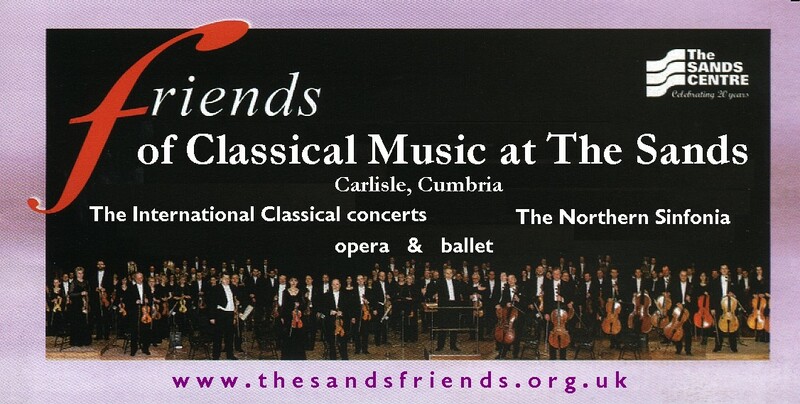 having our own activities outside the concerts in Carlisle, e.g. trips to concerts elsewhere. The Friends have been set up on a formal basis. You can find a copy of our constitution here. If you are interested in being involved, please send an E-mail with your details to: contact@thesandsfriends.org.uk or, better still, complete a membership application form and send it with your subscription of £5.